The aim of Horizon 2020 REFUCOAT project is to develop totally recyclable and biodegradable packages for food products with proper safety characteristics. According to FAO (Food and Agriculture Organization of the United Nations), a third of all the food produced is wasted every year. One of the lines of action to avoid this waste is the development of structures that are capable of extending the life of packaged products. Currently, most barrier containers are based on co-extruded or laminated multilayer structures since there is not a single material that has all the necessary properties. In the case of co-extruded multilayer structures with ethylene vinyl alcohol (EVOH) or other barrier materials, the desired barrier properties are obtained but the recycling process is complex and expensive. On the other hand, in laminated structures the barrier layer is based on chemical vapor deposition of metal oxides which is a very demanding and pricey process, in terms of both energy and materials. The main drawback of these multilayer structures is their high carbon footprint that must be reduced to make more sustainable products. Currently, sustainability is becoming an essential component in the design of new product innovations. Legislative pressure from governments, environmental NGOs and consumers make food manufacturers concerned with providing new sustainable solutions. The use of new biodegradable or recyclable materials reduce the consumption of water and CO2 emissions in their manufacturing processes. The production costs are also reduced through the unification of materials or the reduction of the raw material. The key elements of sustainable packaging are innovation, improvement of the characteristics of the packaging material, differentiation from the competitors due to reduced environmental impact, cost reduction, consumer satisfaction and improvement of the image of the company and the product. The main challenge for sustainable materials is that they do not have the necessary properties of food protection, so it is necessary to introduce new alternatives to increase the product self-life. REFUCOAT project, funded by the Bio-Based Industries Joint Undertaking under the European Union’s Horizon 2020 Research and Innovation programme, works on both aspects: on the one hand, the development and use of totally recyclable and biodegradable materials and on the other, the production of functional coatings with antioxidant, antimicrobial and oxygen and water vapour barrier properties. These barrier coatings will replace the two current alternatives now available in the market: the metallic coatings, which represent a complex and expensive recycling process and the barrier layer of co-extruded structures by coatings with greater compatibility with the materials of the package. 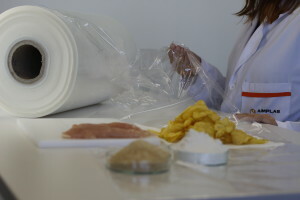 The final objective of REFUCOAT project is to develop different packages for chicken meat, cereals and savoury products. Depending on the main factor affecting degradation of food (humidity, oxygen, proliferation of microorganisms, etc. ), the characteristics of the package and the development process will be different. These final packages will have better mechanical, thermal and barrier properties as the current metallised and non-bio-based alternatives. For chicken meat products and Cereals REFUCOAT plans to develop a fully biodegradable package, whereas the package for savoury products will be fully recyclable. Concerning the biodegradable materials to be developed, middle chain polyhydroxyalkanoate (PHA) will be produced. They are biopolyesters with physical properties similar to fossil-based plastics synthesized by microorganisms. In general, bioplastics have lower barrier properties to gases and humidity than oil-based plastics. This is not the case of PHAs, which are totally biodegradable biopolymers with a low moisture permeability, making them a good alternative for fresh meat packaging. As this material is biodegradable by composting, it can be converted into high quality fertilizer usable as soil improvement. Apart from the biodegradable package, fully recyclable packages will be produced based on bio-PET and bio-PE. The use of materials from renewable sources, which have a lower carbon footprint, will have an environmental benefit. Regarding the barrier coatings, PGA (polyglycolic acid) will be produced. PGA is a totally biodegradable material with thermoplastic behaviour and good compatibility with other biopolyesters and with polyolefins. One of the objectives of the project is to synthesise this polymer through a more efficient, ecological and economic process. In addition, hybrid polymers will be produced from it, through its reaction with silanes, to obtain high barrier biodegradable coatings that will be applied by conventional printing methods and not by expensive methods such as chemical vapor deposition. As a conclusion, this project will greatly improve the development of food packaging in so many aspects: obtaining the same properties as multi-layer systems, preserving the food quality, reducing the landfilling waste and the cost and improving the environmental effectiveness in processing. The European consortium of REFUCOAT is coordinated by AIMPLAS and consists of 12 partners that represent the entire value chain: 2 SME partners (MIPLAST and IRIS), 4 industrial partners (MANOR, DACSA, GRUPO APEX and BIOPOLIS) and 6 RTO Partners (THÜNEN, CIB-CSIC, AIMPLAS, EUFIC, Fraunhofer and AINIA). The project promotes circular economy and considers dissemination and communication to maximize the value of the project outcomes. This project has received funding from the Bio-Based Industries Joint Undertaking under the European Union’s Horizon 2020 Research and Innovation programme under grant agreement 745791. Text provided by Lola Gómez Jiménez, researcher at the Functional Printing and Coatings Department of AIMPLAS.